FOX Camino Stacker pantaloni corti Boardshorts . Here, you'll get a summer feeling!... You're looking for a pair of shorts for the right look on the beach, by the lake or in the swimming pool? 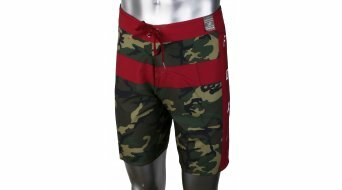 Boardshorts look casual and become more and more popular. They are comfortable, stylish and well-suited for the sporty summer! A robust fabric which dries fast, this is what makes the boardshorts perfect, and not only for the surf ride in the water! They are as popular in the leisure time, on the road, when playing beach volleyball and, and, and. We offer you great shorts, among others from Fox or ION for men and women. Where do the boardshorts come from? As one can derive from the name, they were originally created for surfing (also known as surf shorts). The legs are longer than the legs of common swimming shorts. This advantageous cut does not only convince surfers! The cool designs and the casual shape find more and more fans. So, the shorts also do not have any elastic at the waist, as you otherwise know it from swimming trunks. Real boardshorts feature buttons or Velcro fasteners. Now nothing else is standing in the way of summer - let the heat come! And if the summer does not play along, you'll have the right look even for the indoor swimming pool!